So how much damage can a few rotten tomatoes really do? The tomato-linked salmonella outbreak announced by the Food and Drug Administration (FDA) on June 3 has claimed 228 victims in 23 states over 58 days (and counting). It has put 25 people in the hospital and may have had a role in hastening the death of a cancer patient. And then there's the flurry of panic as many of the tomatoes that American consumers take for granted every day suddenly disappear  from McDonald's hamburgers; from the salsa at Chipotle Mexican Grill; from Burger King, Taco Bell and Sonic; and from the grocery shelves at Kroger, Wal-Mart and Target. Didn't we just go through this with bagged spinach? With peanut butter? With pet food? Because the FDA's tomato-recall recommendation is so specific  including only three types, grown in certain regions during a certain time  and because many national chains pulled their tomato stock within days of the announcement, most of the infected samples have likely been removed. But the outbreak remains ongoing; its source has not yet been determined, and the government is investigating new cases every day. It may be a few more weeks before the delicious staple fruit is given the all-clear. 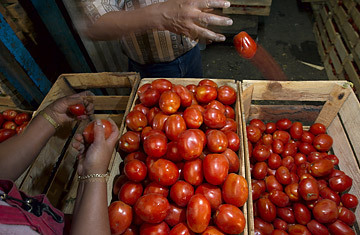 Taking tomatoes off shelves and menus may contain the outbreak, but it doesn't explain it. On May 22, the New Mexico Health Department notified the Centers for Disease Control and Prevention that it knew of seven people recently infected with Salmonella Saintpaul, an unusual strand of the bacteria that accounted for only 400 of the 1.4 million cases of salmonella infection reported last year. And it was precisely because occurrences of the Saintpaul strand are so rare that the report caught the CDC's attention. When Texas and a few other states reported cases of people being infected by bacteria with the same "genetic fingerprint," a multistate search for Salmonella Saintpaul was launched. While the CDC tracked reported illnesses, the FDA interviewed victims to find out what they had eaten (and where). The common answer was tomatoes. There have been 13 outbreaks of salmonella in tomatoes since 1990, which puts the fruit on the list of high-risk foods that are prone to infection. But unlike the bagged spinach from the 2006 E. Coli scare, the tomatoes don't come with a traceable bar code. "When you're dealing with tomatoes, it is much, much more complex," explains Dr. David Acheson, the FDA's associate commissioner for foods. The FDA's great tomato hunt has an ever-expanding list of suspects. A salmonella victim can point to the supermarket (or restaurant) that sold the offending fruit, but that store probably sources its tomatoes from several suppliers, each of which uses several distributors  and distributors buy from any number of growers. "Each set of questions just multiplies into a fan of information that has to be sorted through to understand where the links cross over," says Acheson. Although the FDA has managed to rule out some regions  northern Florida is safe because its tomatoes weren't ready for harvest at the time of the outbreak  it will be some time until the true source is found. "We're not quite there yet," says Acheson, "but we're getting very close." But Dr. Ian Williams, chief of the CDC's OutbreakNet team, warns that the source may never be found due to the fruit's short shelf life. "You don't expect to find an infected tomato sitting on someone's counter 10 days after the outbreak," says Williams. Still, the lag time between the initial outbreak and the government's reaction is startling: the first Salmonella Saintpaul victim fell ill on April 16, but the FDA didn't announce the tomato link until June 3. Williams says part of the problem identifying salmonella outbreaks is that a lot of victims don't see the symptoms  diarrhea, fever, vomiting  as sufficiently severe to warrant a visit to the doctor, and so they go undiagnosed. "There may be a delay in reporting outbreaks because people do not have a stool specimen tested," he says. Officials have not yet identified an infected tomato, and because of the fruit's short shelf life, they probably never will. The FDA unveiled a tomato-safety initiative in 2007 that sought to identify causes of salmonella infection, but Acheson admits that studying preventive techniques doesn't help the FDA deal with outbreaks. The FDA has no plans to change the initiative in the face of the recent outbreak. Even if the FDA can pinpoint the source of the outbreak, it's hard for consumers to know where their tomatoes are grown. Certain imported foods are required to carry country-of-origin labels, but that doesn't apply to domestic produce. "I'm not aware of any tomato outbreak that was not domestic," says Acheson. There is no such thing as a mandatory state-of-origin label for food, and federal authorities have yet to create such a law. "Saying 'product of the U.S.' isn't necessarily going to confer safety," he says. So much for reassurance.